Quality in Care (QiC) Oncology is an annual programme that recognises, rewards and shares good practice in cancer prevention, diagnosis & testing, treatment pathways and patient support throughout the UK. The programme has the endorsement, support and active participation of a number of key stakeholders. 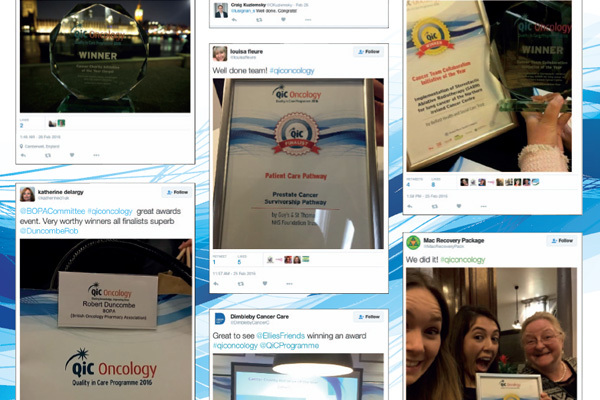 Gaining QiC recognition means an initiative has been highlighted by the NHS, patients and industry as improving patient outcomes and standards of care in oncology. Quality in Care (QiC) Oncology is supported by Beating Bowel Cancer, Breast Cancer Care, Cancer 52, Macmillan Cancer Support, mPharma, Patient Information Forum and The Roy Castle Lung Cancer Foundation.